All plants, including grass, rely heavily on the element nitrogen. Every living cell contains nitrogen. Nitrogen is essential for the production of proteins and enzymes and for photosynthesis. Grass depends on nitrogen for healthy growth and its bright green color. The atmosphere is 78 percent nitrogen. Grasses are unable to process the nitrogen in the air. Lightning plays an important role in the cycle that changes atmospheric nitrogen into plant-usable nitrogen. Lightning plays an important role in providing nitrogen to your lawn naturally. Of the 16 elements that grass needs to grow and flourish, nitrogen is the most important. Grass pull more nitrogen from their environment that any other nutrient. In addition to building proteins, nitrogen is a key ingredient in chlorophyll, the pigment that gives grass its color and an essential component of photosynthesis. Most plants and grasses absorb nitrogen from the soil in the form of ammonium (NH4) or nitrate (NO3) but are unable to absorb atmospheric nitrogen (N2). The nitrogen cycle is nature's way of changing the N2 from the air into plant-usable NH4 and NO3. Precipitation forces the N2 in the air to the ground. Microorganisms including nitrogen-fixing bacteria and nitrifying bacteria fix the nitrogen into the soil and then convert it into ammonium and nitrate. The cycle also includes the transformation of the nitrogen from plant and animal waste into a water-soluble form of nitrogen used by grass for healthy growth. During a storm, a bolt of lightning converts N2 from the atmosphere into ammonium and nitrate. Rainwater dissolves these highly soluble compounds and falls to the earth where it absorbs into the soil. The grass can use these forms of nitrogen immediately without waiting for the microorganisms to do their job. 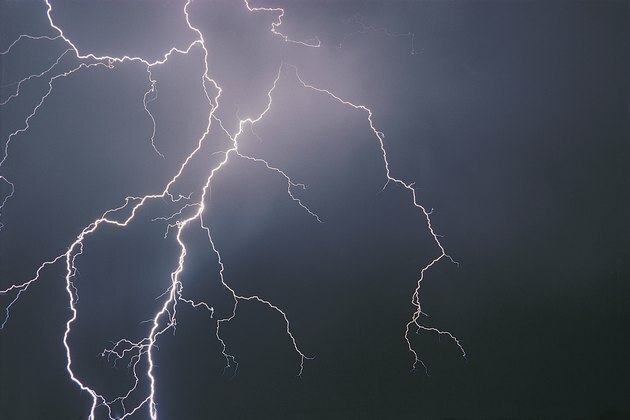 Lightning may contribute up to 50 percent of the nitrates in the nitrogen cycle. Although grass appears greener after a storm because of an illusion created by water and sunshine, lighting still delivers a vital nutrient that keeps your lawn lush and green naturally in the long run. For centuries, lightning strikes have caused fires that left behind miles of blackened destruction in their aftermath. Dry, brown prairie grasses ignite easily during a rainless thunder and lightning storm, and fire spreads quickly. These fires remove dead vegetation that inhibit growth, release nutrients into the soil and reduce the spread of invasive plant species. Despite the initial destruction caused by the lighting, the grasses grow back greener and healthier.